Trends come and go, but there are some tenets in decorating that will always stand the test of time. Elsie de Wolfe, America’s first interior designer who was often referred to as the “First Lady of Interior Design,” was a revolutionary and trendsetter and the first to promote a design concept that revolved around a lifestyle. Her decorating book, The House in Good Taste (1913), has influenced generations of designers and her impact on style, elegance, and the art of living remain an important influence even today. The availability of numerous granite colors in the current American market can make choosing a granite countertop color difficult, even overwhelming. Because any natural stone, including granite, is an investment and ultimately a long-lasting decision, it’s important to get it right the first time. While selecting a granite color for a countertop is is a personal thing, you’ll want to coordinate your granite with the cabinets, floor color, and other aspects of your kitchen to achieve your desired result. Here are some guidance and great tips to help you select the right granite for your countertops. We always encourage our customers to bring a cabinet sample when they visit our show room to select their granite. Even if that means temporarily removing a door, it’s well worth it. The ideal cabinet and granite coordination is a granite that contrasts with the cabinets, but with the natural speckles or veins having hues of the cabinet color. If you have two-tone cabinetry, selecting a suitable granite that goes well with the two different colors can pose a challenge. The basic principle is to select a granite that has hues of the both colors. Making a good selection for countertops requires an eye for detail. In addition to cabinet samples, you will want to bring samples of wall paint, flooring and kitchen appliances to the showroom. (If samples aren’t available, take pictures in good, natural lighting.) Place your samples on or around the granite to get a good idea of what different color combinations look like. Don’t forget the kitchen’s lighting when choosing granite colors! If your kitchen has little or no natural light, select granite that has a significant amount of white or gold, or lots of light-reflecting crystals. Dark colors like deep blue and black look best in areas that receive substantial light. Think about using layers of lighting and including Track and pendant lighting, as well as under-cabinet lighting to enhance the beauty of the stone. 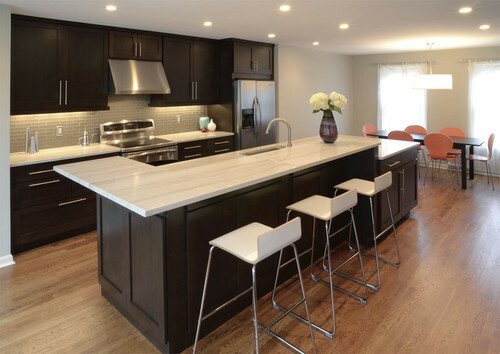 To learn more about kitchen lighting to best show off your countertops, click here. Be sure to consider the size of your kitchen when choosing granite colors. 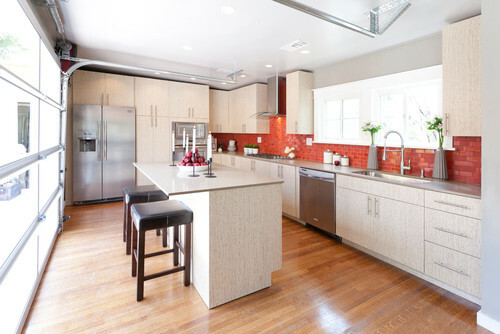 In general, smaller kitchens will look larger with lighter colored countertops. But dark-colored granite with lots of lighter colored veins can offer a stunningly beautiful result in small kitchens, too. This where you have to really pay attention to your lighting. At the end of the day, if you’re torn between two granite colors, consider using both! 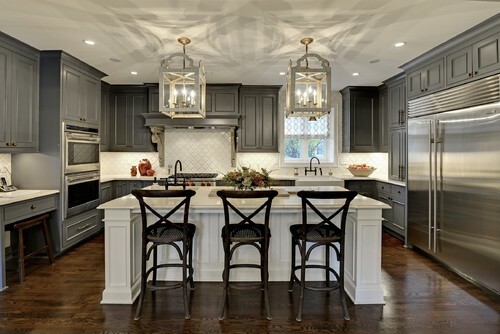 Selecting a lighter color for an island and a darker tone for the surrounding cabinets creates a beautiful contrast. Your kitchen will pop even more with contrasting granite colors that perfectly compliment cabinetry that’s also in two different colors. You know your kitchen doesn’t have to be all white, right? 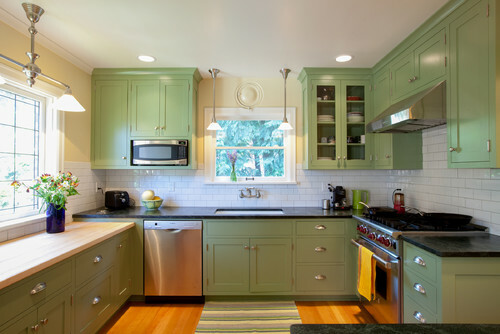 While there is no denying white is still one of the most popular kitchen colors, a new color scheme can change your kitchen in a major way. 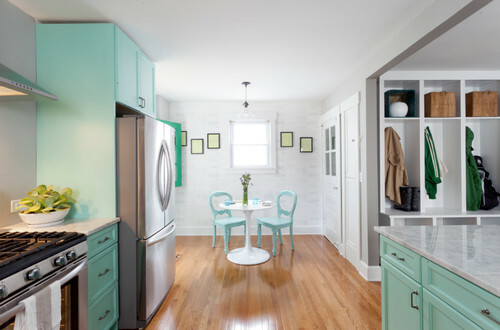 Finessing the right hues can turn the room from drab to sophisticated, add pizzaz to a classic, bring a little drama to a laid-back space, or ground a large room with a robust foundation color Steal some decorating inspiration with these colorful kitchen design ideas. 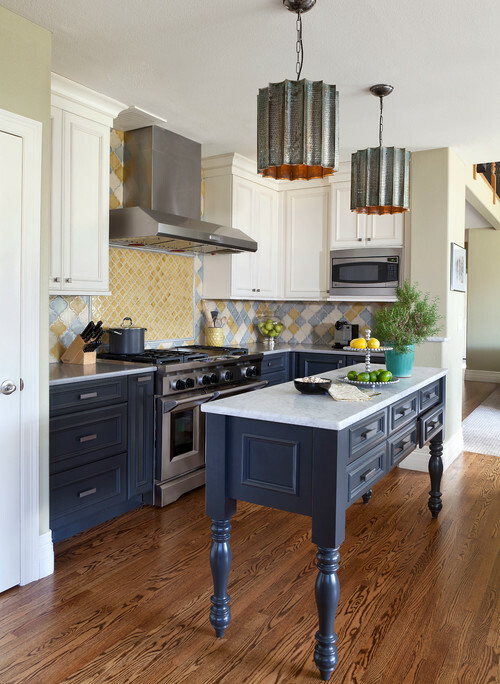 The deep glossy blue on the lower cabinets adds unexpected polish and pop, while still feeling classy and classic. An earthy red is always appetizing. This orangey-red backsplash provides a dramatic focus in the kitchen. Aqua tones are perfect for those wanting (and perhaps even needing) the relaxing, transporting blue-green of tropical seas. This green is wonderfully retro but surprisingly fresh. 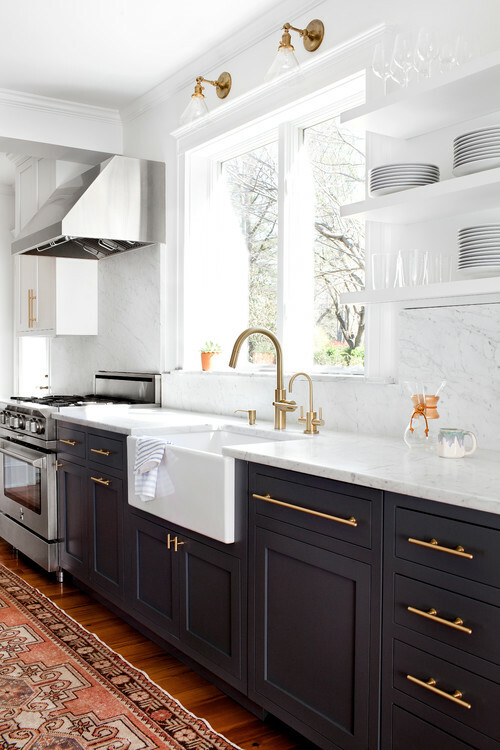 Pops of white prevent the dark espresso colored cabinetry from overpowering the kitchen. Blue up your grays for a look that’s subtly elegant, yet soothing and inviting. 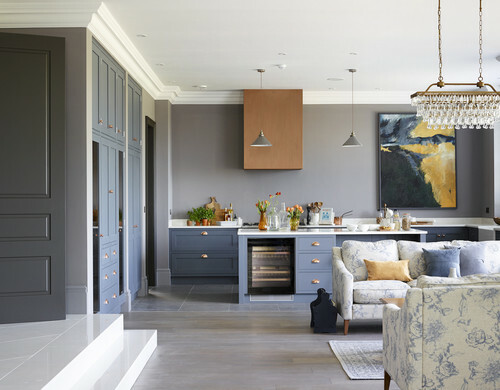 Deep gray is very grounding in this spacious traditional kitchen. Photo by Design Line Construction, Inc.
Black on black is dramatic and sophisticated. Navy and white is nautical, crisp, and timeless. We hope you have enjoyed this look at colorful kitchens. For more kitchen design inspiration of the colorful kind, head over to our Pinterest board. You can count on Prestige Marble & Granite when it comes to selecting natural stone countertops that will integrate with the latest in design and color trends. Stop by our showroom and speak with our knowledgable staff anytime. Designers, builders, and homeowners are all welcome! What Affects Granite Countertop Prices? Gorgeous Fusion granite from Brazil is exotic and rare. All granite is gorgeous, but not all granite costs the same. This is because, while all granite slabs are inherently beautiful in their own way, they are not all the same. There are several factors that will affect the price. Here’s a look at them. The size of the slab will always affect the cost. Larger pieces are more desirable for a couple of reasons. It’s best to avoid seams in your countertop when possible because they tend to more visible with granite. From an aesthetic point of view, one large piece without a seam will always look better than two or more smaller pieces. Also, one piece cut from a slab will be more uniform in color and veining than pieces cut from several slabs. Single large countertop pieces have to be cut from large slabs, which are naturally more expensive. Large pieces of granite are also more difficult to install, adding to the installation cost. Grade refers to the structural quality of the stone. Slabs with fewer imperfections and defects, like pits and fissures, will be assigned a higher grade. There are no internationally accepted standards that exist, however. The levels and grades for granite are determined by each individual wholesaler, therefore, it’s important to purchase your granite from a well-established, knowledgeable and respected dealer. The factor that affects the price of granite the most is color and supply and demand. The relative rarity of some granite colors and hues may make them more expensive. But even more importantly, demand will really affect how much the granite will cost. Some rather exotic or rare colors are more expensive in areas where demand for that particular color is high. So in many respects, the price of granite is greatly affected by how popular a color is in a given area at a given time. Other factors that affect the price of your granite countertops are the number of cutouts that have to be done and any upgraded edges you choose (click here to learn about some of the edges available). Just because a slab of granite isn’t considered rare or exotic, or isn’t in low supply due to high demand, doesn’t mean it can’t make an attractive countertop in your kitchen. But keep in mind that you are likely to live with your granite countertops for many years to come, and you’ll be most satisfied with your purchase in the years ahead if you spend a bit more to get the type, color and look you really want. While we offer a large array of beautiful natural stones to fit all budgets, we specialize in unique, hard-to-find countertop material. We source the most extraordinary, rare, and exotic marble and granite slabs that will enhance your space with a distinctive, one-of-a-kind look. Here in our indoor showroom, you’ll find one of the most extensive selections of the highest quality, designer-grade natural stones available in Middle Tennessee.